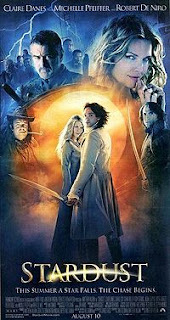 Yesterday after work, I watched the movie Stardust in MegaMall Cinema 1. After lunch, my friend during College invited me to watch Stardust after work. Not only he bought my dinner but he also paid for my movie ticket. We met at Powerbooks then went straight to Sbarro. We had a slice of pizza each and we shared a plate of baked ziti. The movie started 7:05 P.M., so we were in a hurry while eating. Inside the cinema, you would notice the huge turnout of moviegoers. The movie in general is a fun movie to watch. I wasn’t disappointed with the special effects or the actor’s performance. Michelle Pfeiffer and Robert De Niro did great in the movie. I like most the comedic performance of Robert De Niro. I did not expect him to play a role like that. The movie narrates a simple story yet it feels like I’m back on being a kid enchanted with happily ever after stories. There’s something lacking though in the movie. It would be nice to show what happened in the end instead of narrating it. Nice movie indeed especially when it its free! I saw Stardust and loved it too. It was my turn to pick the movie and I had picked American Gangster but it was sold out so we ended up picking Stardust almost at random. I'm so glad we did though! It had everything. I liked Stardust a lot. I didn't feel there was something lacking, and I went in with low expectations, and am also quite picky. Here's my review.